Wow, I guess the negative comments from the Honda Crosstour really wounded the mighty Honda's self-perception. 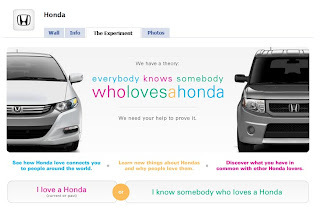 Their latest foray into social media marketing is a new Facebook application called "Who Loves a Honda?" that they are advertising on the Facebook site. It asks people to say they love a Honda and/or to send a notice to someone they think also loves a Honda. 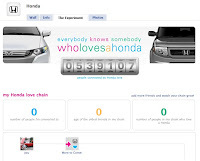 The application is a "love chain" (Honda's words, not mine) counting how many people you are connected to who love Honda, the age of the oldest Honda, and the number of Honda lovers connected to your profile. All of this creates a massive amount of "Honda Love" that as of this evening reached over a half a million across Facebook. Maybe a half a million votes of love will make Honda feel better after all those awful things people said about their Accord Crosstour? Or is a million or 5 million the right number? Other than spreading the word about Honda, the Facebook application does nothing else. It is basically a way to identify oneself as a lover of the Honda brand, which by the way is the whole point of being a "fan" of a brand on Facebook. Seems to me just having a decent count of fans on the social network would be a good enough way to measure brand love. The 22,000 plus fans just wasn't enough considering Ford has over 40,000 and General Motors over 120,000. This application Honda created is their way of getting people to really prove it, as their ad pathetically asks "help us prove it". Self-doubt is really unattractive and really who likes to hangout with someone constantly asking for acknowledgment of your love. The "Who loves a Honda" application provides no consumer value beyond what a typical "Become a Fan" does. In fact it does less, at least when you fan a brand you get notified of updates, but this application just let's you prove your love like bringing flowers home after saying or doing something wrong to your spouse. Now that they have received some public love on Facebook after their Accord Crosstour fiasco, can we all move on and sing kumbaya, because this is getting weird. Right. Because this couldn't simply be a fun take on the 'small world' concept that everyone in the world is connected through one means or another. No, certainly couldn't be that. Right. And Honda didn't have a bit of social media crisis on their hands days before this application was being promoted on the same site the social media issue was happening on. I'm sure they were totally unrelated. I timed myself. It took me 22 seconds to do the research on this. You blogged about Honda's "social media crisis" on September 1st. A Google search for "who loves a honda" (my first try) gave this site as the second search result (the application being first), which clearly shows that this application has been around since at least August 8th - nearly a full month before the so-called "media crisis". So, no, this clearly wasn't intended as a response to something that happened days before you discovered it, since it existed weeks before that. I'd be more worried about the lack of traffic to your sad little corner of the Internet here than about what Honda's up to. 20+ entries and I'm your first commenter? FIRST - EVAR! Thank you for the rant. Just to clarify, I did not say the application was created for the Crosstour event; rather, it was being promoted after the Crosstour fallout, meaning marketing dollars were being spent on Facebook to promote more love for the brand after its recent battering. I know that getting an application idea created, produced and published on Facebook isn't something that is done in a few days, possible I suppose, but I made no assumption this application was created because of the event; rather, it existed and was now having media weight spent to support it because of the recent event. Looking back on my article, I could've made this point better. It was definitely an assumption on my part, but one that seemed plausible based on what was happening, since I started to see the first ads on Facebook promoting the application shortly after the Crosstour situation. Look you are obviously someone from RPA, the agency that produced this. So, I understand if it is a bit sad that my "sad little corner of the Internet" was the only one who created any buzz for you since, according to you and Google, this blog was the second ranked site in your search. And while I do appreciate your comments and any comments, even the crazy ones. You aren't the first to comment here. Out of the last 20 entries on this blog, there are 11 comments (not counting this discussion.) Sure not a lot, but this is a niche site that is fairly new. So, maybe you're right and I'm wrong and this had nothing to do with the Crosstour event. Good. Based on the timing of events, it certainly looked that way with the media buy used to promote some love for Honda. Honda doesn't have the inferiority complex, my friend, you do. Here you are, a Detroit car ad executive obsessing about another car competitor's advertising. Rather than endlessly complain and toss around false insights, why not do some half-way decent advertising. On another note, this is what they call corporate sabotage. Do your bosses know what you're up to? I'm sure they wouldn't approve. You should be fired. Ironically, for your social media skills and your inferiority complex. Enjoy your commute on the way to work tomorrow in your Mercury Sable. That is, if it doesn't break down on you. P.S. I'm not from Honda, but as someone that knows the ad industry, your blog is a disturbing trend that I hope will be flushed out with the rest of bad marketing. Wow. Quite the reply there. I'll just leave this weird back and forth with one final piece of information. So Mr or Mrs Anonymous I think my guess that you are from RPA is a pretty good one and since you are not revealing yourself this is all we have to go on. I do apologize for being a bit flip by mimicking your original flip "Right" comment. Obviously this post struck a cord leading me to believe my analysis is correct on some level. By the way, the Mercury Sable does very well in long term JD Power quality studies. Also, you might want to look up what 'corporate sabotage' means because you are way off. Again with your sad conspiracy theories. I wrote the last comment, but not the other ones. so it seems, chris, there is more than one person that finds your blog full of hot air. And no, I'm not from RPA. You can check the IP address (though that kind of defeats the purpose of inviting people to comment on your blog anonymously). You seem to have some issues about RPA. Did you apply for a job there and get turned down? My issue is not with RPA, or Honda. Or which campaign came out first. My issue is with a strategist for a car company (you) smearing another car company, with what seems to be inaccurate reporting, and abusing social media. I think it's a bad practice. Or, at the very least, whiny.